Rebecca is an acclaimed harpist and teacher who combines her Classical music background with a passion for folk music to create a unique expression. Rebecca is a notable member of the Vancouver music scene. She has performed for the President of Ireland, and groups like the Vancouver International Song Institute, and the International Bar Association. Rebecca offers twenty years of professional experience performing at concerts, weddings, memorials, private and corporate events. 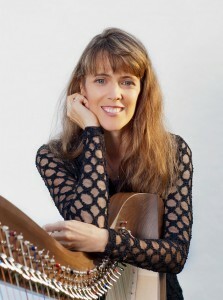 Her musical styles range from Celtic to Classical and Popular. Rebecca is a notable harpist in the Vancouver music scene, giving concerts and playing at events regularly around the city. Her approach to performing and teaching the harp draws on her classical background to enrich her passion for improvisation. She has had the honour of performing for distinguished audiences such as the Vancouver International Song Institute, the International Bar Association and the President of Ireland. Rebecca offers over twenty years of professional experience performing at weddings and memorials as well as private or corporate events. Her collection of musical styles is very diverse, ranging from Celtic, Classical to Popular. As a studio musician, she has contributed to a number of recordings such as “Orrachan” by Teresa Doyle, and “Nigawe Aski” (Mother Earth) by Sandy Skofield. 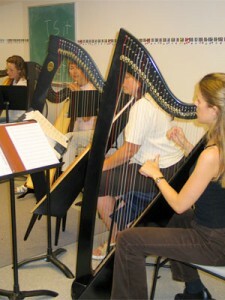 Rebecca regularly gives harp workshops around the lower mainland such as Early Music Vancouver and Place des Arts. Her busy schedule includes teaching Celtic harp, recording, and performing with the group Triskellion. Let the beauty of the Celtic harp add elegance to your ceremony. Rebecca is available as a studio musician or to provide music to any special event. Rebecca has over 30 years of experience teaching music to students of all ages. 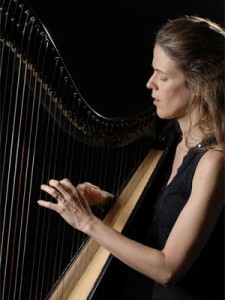 I would recommend Rebecca to anyone looking for a superb harp teacher. She is able to work with me to find the way best suited for me to learn. 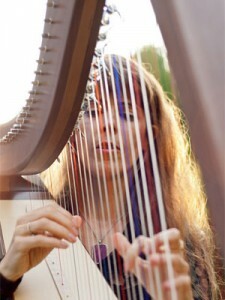 Rebecca brings an abundance of knowledge from her multi-disciplined background to each one of her harp students. Thank you Rebecca for never running out of innovative ways to learn! Rebecca is a gem! She has a very positive style and her skill and love of music are inspiring. I am so fortunate to have found Rebecca Blair for a teacher. She is patient, knowledgeable and has made learning fun. Rebecca's beautiful playing added a festive, elegant aspect to our annual Christmas event. It was a wonderful part of the evening.